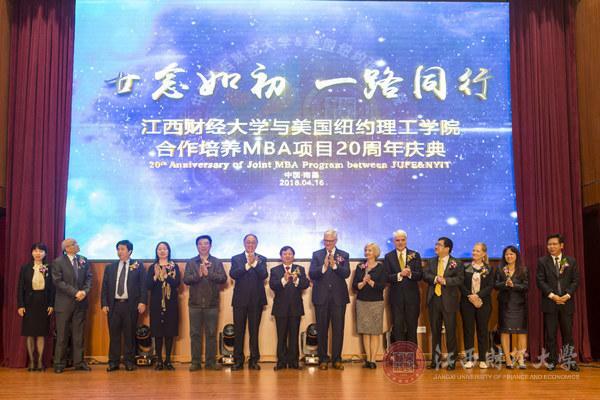 On April 16th, the 20th Anniversary of JUFE-NYIT Joint MBA Program was celebrated in JUFE Jiaoqiao Campus. School Leaders from both sides attended the ceremony.From JUFE side, include Lu Fucai, JUFE President, Liu Xiaoli and Wang Xiaoping, both JUFE Vice Presidents, Liao Jinqiu, President of JUFE Alumni Association, Shi Zhongliang,former JUFE President and the other side are Dr. Hank Foley, President of New York Institute of Technology(NYIT), his wife Dr. Karin Foley, Dr. Reinisch, Acting Provost and Vice Chancellor (Academic), Liu Xianfang, vice director of Management Department. Besides those attendances above, managers and teachers of this program, previous program graduates, 2018 program graduates jointly attended the ceremony with a total number of 200 people. With the theme of “Never change the ideal to our hearts , stand shoulder to shoulder”, the ceremony was aimed to review the past experience and accomplishments in running schools jointly, provide an outlook of 2018 and future planning， deepen the joint MBA educational philosophy, promote the cooperation spirit and share the harvest. The celebration started with an elegant and charming Chinese classical dance "blue and white porcelain", which added eastern verve to the ceremony. Then all the audiences reviewed the vicennial development of this joint MBA program through the old pictures and in the melody of "yesterday once more". 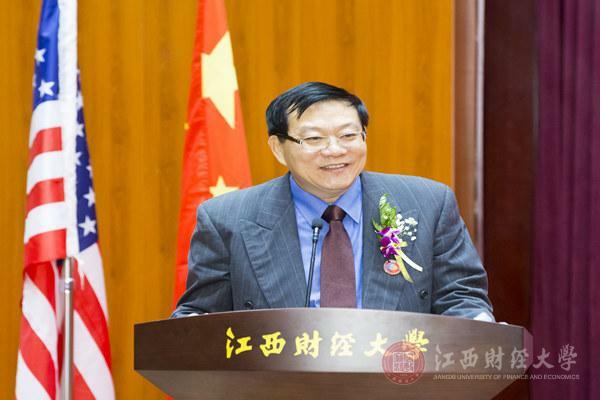 After the exciting opening ceremony, Mr.Lu Fucai and Dr. Hank Foley made a speech respectively on behalf of each side, they summed up the process of school running, laid out the joint blueprint and made deep wishes for the joint MBA program together. 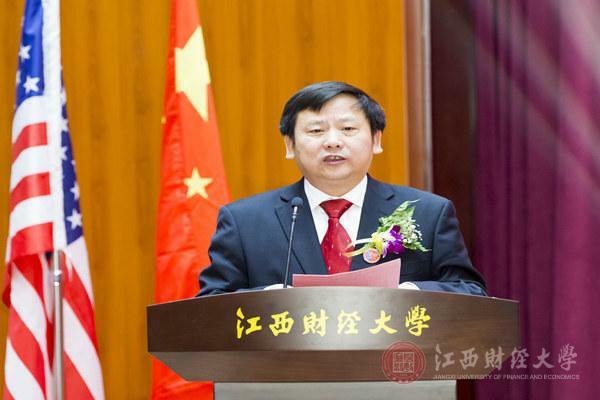 In the speech, President Lu pointed out that over the past 20 years, JUFE and NYIT had worked hand in hand to produce a win-win situation, continuously fused the cultures of two universities and created new ideas of school running, gradually developing 6 program features: the educational aim of making study serve the practical purpose, the powerful joint faculty team, a combination of western and eastern training scheme, interactive teaching and studying methods , team work spirit shaping, a wide and mutual-aid functional business network, all the efforts made above made the joint MBA program successful extraordinarily. With over twenty years efforts, the Joint MBA program had achieved a great success and trained over 1700 graduates who were later the administrative business talents with strategic vision, international outlook and innovative thinking. 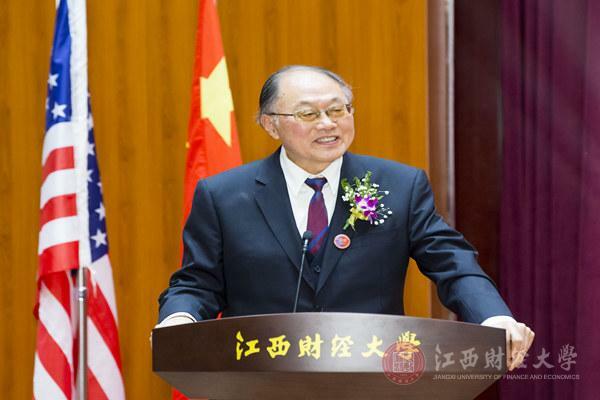 President Lu also hoped that the two sides could continue to explore actively, put belief into practice bravely, further the educational reform in concepts, contents and methods, promote this joint program to become a brand project with the features of “internationalization, distinction and high-level” and strive for the educational communication and cooperation between two nations. 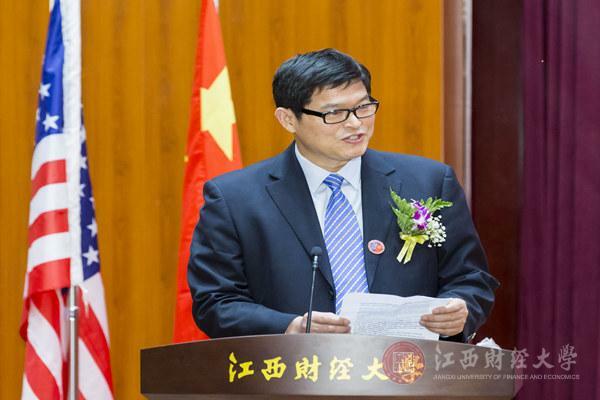 During the ceremony, Shi Zhongliang and Liu Xianfang's statements moved all the audiences, other representatives also made vivid presentations about the past 20 years'development of the joint program , they are Wang Xiaoping, JUFE Vice President, Ye Weihua, President of Foreign Languages School, JUFE and former director of joint MBA program, Mao Shuzhong and Xie Jing,the first graduation and the famous alumni representative of joint MBA program. 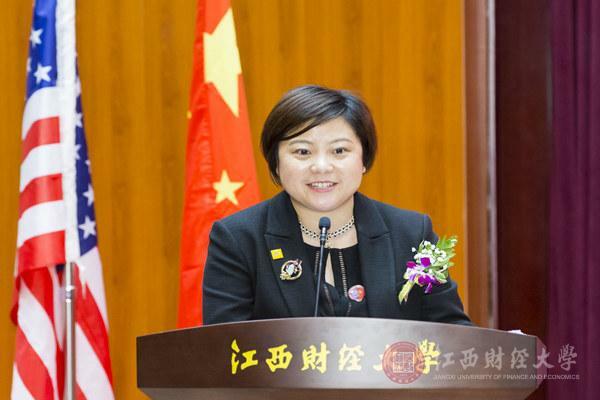 The 20th anniversary celebration not only witness the cooperative process between JUFE and NYIT, but also becomes a milestone of JUFE’s internationalized school running. The joint MBA program is one of the earliest sino-foreign cooperative education projects, which is approved and degree conferred by the National Ministry of Education.Over the past 20 years, the Joint MBA program had trained over 1700 graduates who later became the versatile, international and senior management talents. Both sides also kept fusing cultures of two universities, creating new ideas of school running and gradually developed 6 program features: the educational aim of making study serve the practical purpose, the powerful joint faculty team, a combination of western and eastern training scheme, interactive teaching and studying methods , team work spirit shaping, a wide and mutual-aid functional business network, all the accomplishments achieved above not only played an active role for educational culture and exchange between two nations, but also made an essential and successful model for JUFE’s internationalized school running, fortunately, after 20 years’communication and cooperation, we finally harvest.